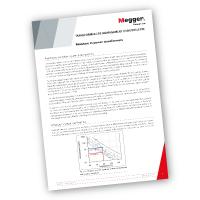 To aid in the building, growth, maintenance and organisation of a library (corporate or personal), Megger has developed a comprehensive series of Transformer Life Management (TLM) bulletins that broadly cover the fundamentals of managing the life of a transformer. The bulletins span topics from moisture in transformers to each of the many electrical tests available to assess the condition of a transformer or instrument transformer. Moisture in transformers, for example, is a huge subject so there is value in overview summary publications that introduce the topic. If you collect all publications you can find on a topic, Megger TLM bulletins would be suitable to place at the front of each collection to introduce and frame that subject. In appreciation for your support through the years, and because a more informed individual is our best customer, Megger invites you to download a newly featured TLM bulletin each month at no charge to you – every month you will receive an alert as soon as the latest bulletin becomes available. Download the latest bulletins now to learn more and start reclaiming the potential of your library today.